Spring is a time of rebirth and renewal. It’s also a time when plants and flowers burst forth, releasing their pollens into the air and triggering misery for allergy sufferers. The numerous types of oak, hickory, ash, willow and mulberry found in and around Charleston create a storm of pollen and spring allergens. Environmental allergens like dust, mold, and dander, and it’s not surprising that allergy attacks increase in the spring. A cold tends to be accompanied by coughing, sneezing, runny nose and wheezing. Allergies may show up as coughing, sneezing, runny nose, or wheezing. So how do you tell the difference? 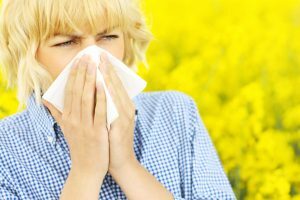 The first sign that you may be suffering from allergies and not just a seasonal cold is the duration. If your “cold” symptoms linger for more than two weeks, consider being tested for allergies. Itching eyes and nose may also be symptoms of allergies, but rarely appear with colds. Colds tend to be accompanied by body aches and fever. When spring arrives, it’s tempting to fling open the windows and welcome in the warmer air. Unfortunately for people suffering from allergies, this might be exactly the wrong move. Opening windows wide allows all the pollen and spring allergens that are swirling around to sweep into the home. Still, spring is a time for cleaning and clearing your home. Change filters on heating and cooling units. Wipe down walls and other surfaces, and thoroughly wash bedding in hot water to remove mites and dander. By removing as many allergens as possible from your home, you can find relief. If you suspect you or your child are suffering from allergies, it’s important to get tested as soon as possible. Book your appointment with Alpha Care, and keep track of your symptoms in the days leading up to the appointment. We’ll discuss your medical history, symptoms, and begin building a plan for combatting your seasonal allergy symptoms. Call Alpha Care to arrange your appointment today.